The book describes 12 easily accessible locations in the Lake Tahoe region where Mark Twain traveled or stayed, including the location of his infamous experience of setting a considerable part of that “fairest picture” ablaze. 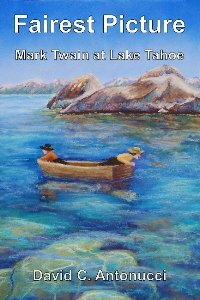 Fairest Picture also follows Mark Twain’s writings about Lake Tahoe, including his objections to the name “Lake Tahoe,” and debunks a number of Mark Twain-Lake Tahoe myths. Antonucci is a local historian and also the author of “Snowball’s Chance – The Story of the 1960 Olympic Winter Games.” After the talk, there will be a meet-and-great session with book signing opportunity or guests can receive a remarque from the book’s cover artist. September 2011 marks exactly 150 years since Samuel L. Clemens, known widely as Mark Twain, first visited Lake Tahoe. He first arrived with the unrealized goal of staking a timber claim but returned less than two years later as Mark Twain, reporter and columnist for the Virginia City Territorial Enterprise. Fairest Picture describes what pristine Lake Tahoe was like during the time of Mark Twain’s visits. The climate and the lake was colder than today. Clarity was perhaps as much as twice today’s measurements. The lake teamed with fish, dominated by huge Lahontan cutthroat trout. A soaring old growth forest with trees hundreds of feet high and 3-5 feet in diameter ringed the lake. In summer, natural low intensity fires burned through the undergrowth reducing morning visibility. The mountain tops of the Sierra Nevada held year-round snowfields. Part of author David C. Antonucci’s research involved decoding Mark Twain’s writings to separate out fact from fiction and exaggeration. 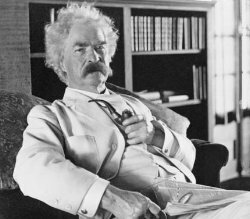 Mark Twain’s Roughing It was creative nonfiction that contained exaggeration, outright fabrications and misstatements of fact. Correctly interpreting the portion of the text pertaining to Lake Tahoe required critical evaluation through the lenses of geology, limnology, physics, geography, astronomy, biology, semantics, deductive reasoning, and, of course, the natural and cultural histories of Lake Tahoe. The book solves the riddle of the location of the timber claim and describes Mark Twain’s subsequent visits to 19th century luxury hotels. Historical research and scientific analysis showed the timber claim was located on the North Shore of Lake Tahoe with campsites at Stateline Point and modern-day Tahoe Vista, also the site of the accidental wildfire. Later, Mark Twain returned to stay at a luxury hotel on the south end of the lake and at a hotel on the East Shore, just south of Glenbrook. The book reveals new information about Mark Twain’s travels in nearby Alpine County in 1863 and an 1868 trip by train, sleigh and stagecoach over Donner Summit and through Truckee, Calif.
For the first time, all verified and documented Mark Twain quotations about Lake Tahoe appear in one place along with the context and interpretation. The book follows Twain’s evolution on descriptions of the lake beginning with praises for its beauty and spirit and health restoring properties. He then descends into harsh criticism and public rants over the change of the lake’s name in 1862 from “Bigler” to “Tahoe.” He uses Lake Tahoe as his gold standard for all lakes and compares other world lakes to Tahoe in his travel writings. By the time he writes about Lake Tahoe in Roughing It, he has moved beyond the name change and returns to the magnificent beauty, spiritual renewal and health restoring power of Lake Tahoe. The book includes an appendix of known Mark Twain writings and lecture remarks about Lake Tahoe. Mark Twain scholars and enthusiasts will appreciate the book’s detailed maps and directions to 12 places visited by Mark Twain and mentioned in his writings, including his North Shore campsites. Mark Twain literary pilgrims can visit his lakeside campsites, see the site of a cabin where he “borrowed” the owner’s boat, and view the site of the upscale hotel where he stayed. They can walk sections of old wagon roads he traveled by stagecoach. One chapter is devoted to debunking the many Mark Twain-Lake Tahoe myths and legends that have abounded since he first appeared at Lake Tahoe. Detailed research showed that Mark Twain never visited Cascade Lake, nor did he say Lake Tahoe was the “jewel of the Sierra.” Extensive research and analysis discredit the East Shore timber claim myth as a fabrication of early 20th century tour boat captains that was carried forward by historical writers. David’s interest in Mark Twain’s adventures at Lake Tahoe began when he enrolled in a community college class on Lake Tahoe history. For a term paper assignment, he chose to apply his civil engineering skills to analyze Mark Twain’s route and locations of his encampments at Lake Tahoe in 1861 based on the Roughing It account. This led to rediscovery of Mark Twain’s Ash Canyon-Washoe Trail route to from Carson City, Nev. to Lake Tahoe and specific campsite locations on the North Shore. Antonucci’s initial research was validated by the class instructor, the late Lyndall Landauer, PhD, Tahoe historian and author of Mountain Sea: A History of Lake Tahoe. He presented his findings to an audience of respected scholars at the 2005 Conference on Mark Twain Studies at Elmira College, Elmira, N.Y.
David C. Antonucci has resided in the Lake Tahoe area for over 36 years. He holds bachelor and master degrees in civil and environmental engineering from California State Polytechnic University and Oregon State University, respectively. In 2009, David published the very popular Snowball’s Chance – The Story of the 1960 Olympic Winter Games. The book won the Ullr Award from the International Skiing History Association for its major contribution in book form to skiing history. The book is available locally at museum gift shops, Bookshelf Stores (Tahoe City and Truckee), Mark Twain Cultural Center, Potlatch and MindPlay (Squaw Valley), online at www.createspace.com/3654392 and Amazon.com and by special order at Barnes & Noble. The cover is from an original pastel by David’s wife, Jenny Antonucci, and is based on an illustration from Mark Twain’s Roughing It. An accomplished artist, Jenny has drawn the Lake Tahoe Marathon artwork for the last five years.